This is a musical starring Doogie Howser playing an aspiring super-villain who blogs. Yea, this movie is that random. But, it works! Neil Patrick Harris continues his resurgence in this oddball comedy/musical (click here to add to your queue). It was really well acted, the songs were funny and the premise is so whacked-out that you can't help getting sucked in. It reminds me a bit of Bubba Ho-Tep, it's a movie that on paper really shouldn't work but somehow really does. 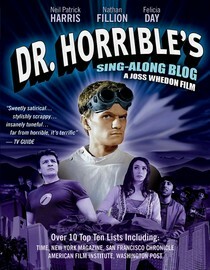 Dr. Horrible (Harris) is in love with the deceptively adorable Felicia Day and for a super-villain he really has a tender side, it's very charming. You should really watch this, it's a good time. To be honest I never thought I'd be reviewing or recommending a musical on this blog, just not usually my thing. But, this one is worth it. 5 Stars! Why is it in your queue? The randomness of the title, oh and it's (sorta) about blogging. Best thing about the movie? Everything. What mood should I be in to watch this movie? Off the wall. Gosh darn it! I never have time to watch all these movies you are making me add to my queue! Looking forward to this one...I love musicals, blogging, AND Neil Patrick Harris. What could go wrong? at least they'll be there when you're ready!